Lately I've been really trying to make it a point to incorporate more greens into our diet. I use chard (my favorite green) in my morning smoothies, eat spinach salads for lunch, and then try to have one dinner a week where the greens are a main component. It's only been mildly successful because Joey isn't a fan of all greens, but I take my wins when I can. This fried rice was definitely a win. Its fast and easy, it's very healthy, and it's tasty to boot. The kale is sliced into thin little ribbons, then sautéed with the mushrooms. You add the (already cooked) rice, a few simple seasonings, and you're done! I think Joey doesn't care for kale on account of the bitterness, but it is masked a bit here by the soy sauce, garlic, and mushrooms. This could be a light main course all on its own, but I served it alongside the teriyaki salmon. With dishes like this in my repertoire, getting more greens into our diet is becoming an easier task. Now if I could just get Joey to eat beets, I'd be money. Roll a few kale leaves into a tight cigar, and thinly slice to form ribbons. Run your knife through the kale a few times to chop it into smaller pieces. In a large skillet, heat the oil until shimmering. Add the kale and mushrooms, and cook, stirring often, until they are softened and tender, about 5 to 8 minutes. Season with salt. Add the garlic and red pepper flakes, and stirring constantly, cook until fragrant but not browned, about a minute. Stir in the scallions and rice, and cook another 2 minutes, stirring often. Add the soy sauce, cook another 30 seconds, and season to taste with salt, additional soy sauce, and/or red pepper flakes. Divide among serving dishes and top each serving with more scallions and a sprinkle of sesame seeds. Um, I adore the last line of this post! What a fabulous combination of flavours! This sounds simply lovely. I've been OBSESSED with greens lately! My next few recipes use them...swiss chard is my favorite also and whole foods now carries this 1 pound tub of different varieties of kale that I keep buying. It's a serious addiction but a good one. so I'll keep it. Love the sound of this fried rice! Pinned it! This dish looks incredible! 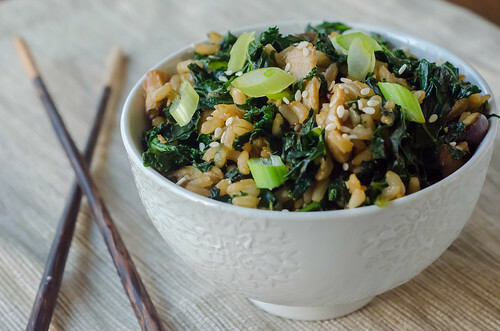 I've been trying to add more kale to my diet and I will definitely give this recipe a try. Thanks for posting! looks great and right up my alley. i am definitely making this! I made something similar as a side dish one night, and while it was good then, the leftovers were awesome the next day for lunch topped with a poached egg. Love kale! 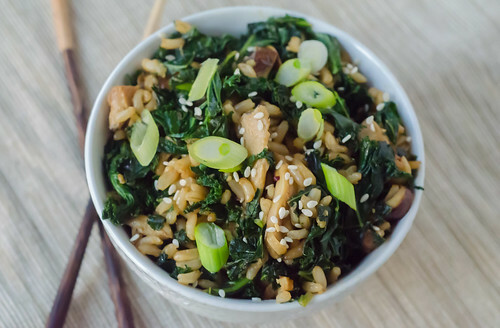 wonderful, wonderful blend of hearty ingredients - kale, shiitake, brown rice - all healthy! i love your blog by the way! consider yourself blogrolled! LOL! This looks fresh and wonderful! Baby-prep has left my Google Reader embarrassingly ignored. So my apologies for the delay in commenting! How funny though, I was just telling a friend about this dish yesterday. I LOVE your addition of shiitake mushrooms. This looks great! YUM. So easy and healthy! Made this with baby bella mushrooms and it was still fantastic. :) Great and gluten-free, too. What? Beets are da bomb, Joey would do well to start eating! But anyway, this fried rice bowl looks phenomenal. I love how it's brown rice specifically, and that there's more veggies than rice in the bowl. :) healthy and delicious at the same time!